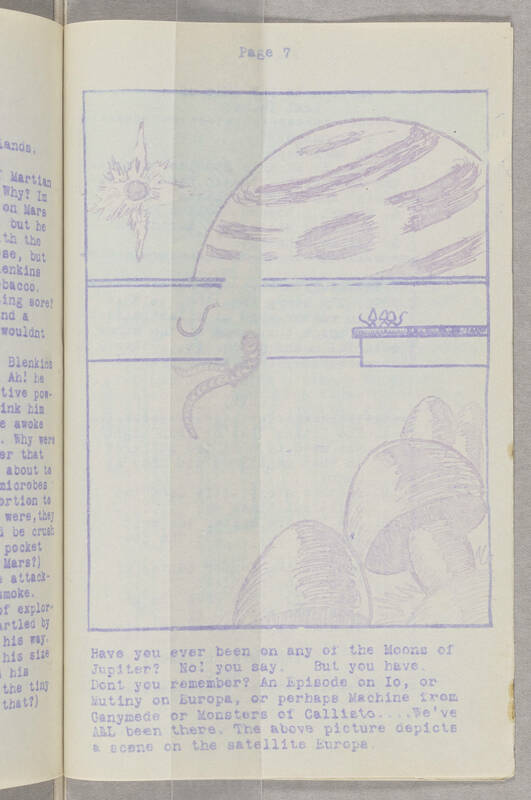 Scenes of Fantasy, v. 2, issue 1, whole no. 5, 1939? [Illustration: A room with mushrooms in the foreground, aliens in the midground, with Jupiter, as seen from Europa, visible through a window.] Have you ever been on any of the Moons of Jupiter? No! you say. But you have. Dont you remember? An Episode in Io, or Mutiny on Europa, or perhaps Machine from Ganymede or Monsters of Callisto... We've ALL been there. The above picture depicts a scene on the satellite Europa.